Two journalists, including an Australian editor, went on trial in Thailand Tuesday over a report they published implicating the navy in human trafficking, as the United Nations urged the junta-ruled nation to drop the case. The trial comes after the region's grim people-smuggling trade was dramatically highlighted in May when thousands of migrants were abandoned at sea and in foetid jungle camps by traffickers following a Thai crackdown, a crisis that eventually forced Southeast Asian governments to respond. The charges against Alan Morison and his Thai colleague Chutima Sidasathian, of the Phuketwan news website, relate to a July 2013 article quoting an investigation by the Reuters news agency which said some Thai navy members were involved in trafficking Rohingya Muslims fleeing Myanmar. The pair could face up to two years in jail for criminal defamation and five years for breaching the Computer Crimes Act if they are found guilty. The trial at Phuket Provincial Court began with a testimony from R.N. Pallop Komlotok, a navy captain, who confirmed he filed the defamation case on behalf of the navy, Siriwan Vongkietpaisan, a lawyer for the accused, told AFP. "He also confirmed that the Phuketwan quotes were lifted from Reuters article," she said. Reuters has not been charged over its reporting -- part of a series honoured with a Pulitzer Prize last year -- and rights groups have accused the navy of trying to muzzle the smaller Phuket-based English-language media outlet. Speaking to AFP ahead of the trial, Morison said: "We do not understand why the military government has not withdrawn the case. "The initial pursuits against Reuters were dropped. We quote exactly the same paragraph... (They are pursuing us) for only one paragraph reproduced word-to-word from Reuters." After the hearing closed for the day Chutima said she felt "confident" the pair would be cleared and that she and Morison were due to give their testimonies when the trial resumes Wednesday. A verdict is expected within 30 days. On Tuesday the United Nations Human Rights Office urged Thailand to drop the charges against the two journalists. "Freedom of the press, including freedom for journalists to operate without fear of reprisals, is essential in promoting transparency and accountability on issues of public interest," it said in a statement. Phil Robertson, from Human Rights Watch, called the trial a "scathing indictment of the Thai government's unwillingness to respect media freedom". "Prime Minister General Prayut should have ordered the Navy to stand down and withdraw the charges -- but instead he effectively endorsed their effort to gag media critics, and in doing so, administered another body blow to what little remains of Thailand's international rights reputation," he said in a statement. Tens of thousands of the stateless Rohingya, one of the world's most persecuted minorities, have fled Buddhist-majority Myanmar's western Rakhine state since 2012, when deadly unrest erupted. In recent years they have increasingly been joined on dangerous sea crossings by economic migrants from neighbouring Bangladesh with their rickety wooden boats mainly headed for Malaysia. In May a Thai crackdown on the lucrative smuggling industry saw traffickers abandon their human cargo at sea, sparking a regional migrant crisis. 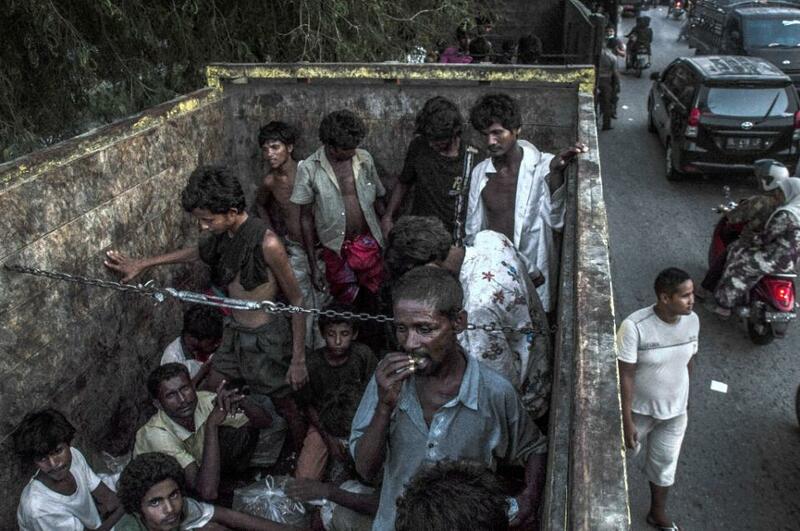 Around 4,500 Rohingya and Bangladeshi migrants were stranded in Southeast Asian waters and ping-ponged between countries reluctant to accept them until they eventually landed ashore on Malaysian, Indonesian, Bangladeshi, Myanmar and Thai soil. Thailand has seen a rapid erosion of civil liberties -- including a ban on political protests and any criticism of the ruling regime -- since the military seized power from an elected government in May 2014. Its southern provinces have long been known as a nexus for people-trafficking and rights groups have accused Thai officials of both turning a blind eye to the trade -- and even complicity in it. Dozens of people have been detained in the recent crackdown including some local officials and a senior military officer accused of being a major smuggling kingpin.